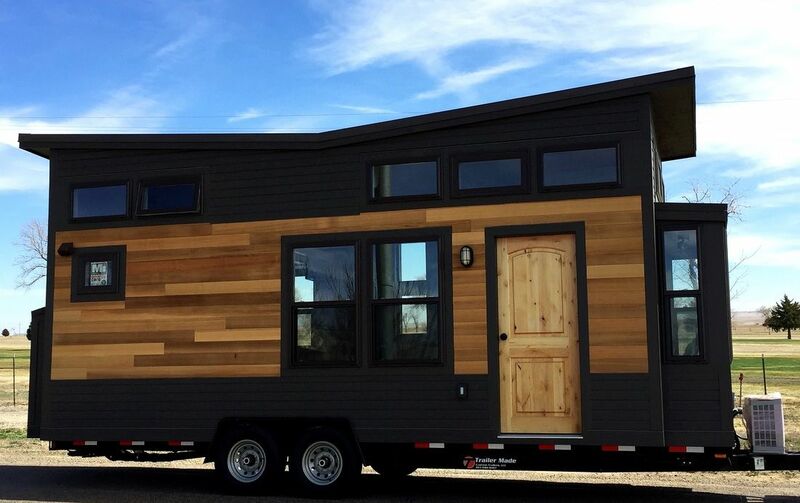 California-based SunWest Tiny Homes currently has three models of houses on wheels to offer, the largest of which is the Outlander, a tiny beauty with a swayback roof. The home is one of those "leave no stone unturned" designs. 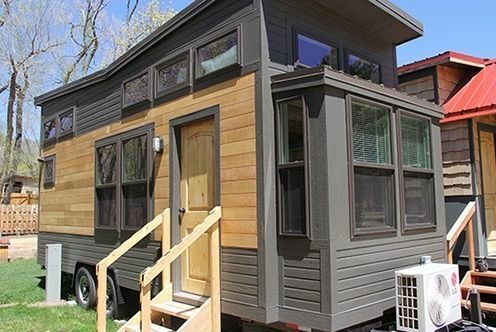 It has 350 square feet of living space, it can survive on or off grid, and it comes with bamboo flooring and a fully nontoxic interior, which means it is essentially free of fumes. The roof, meanwhile, is no accident. 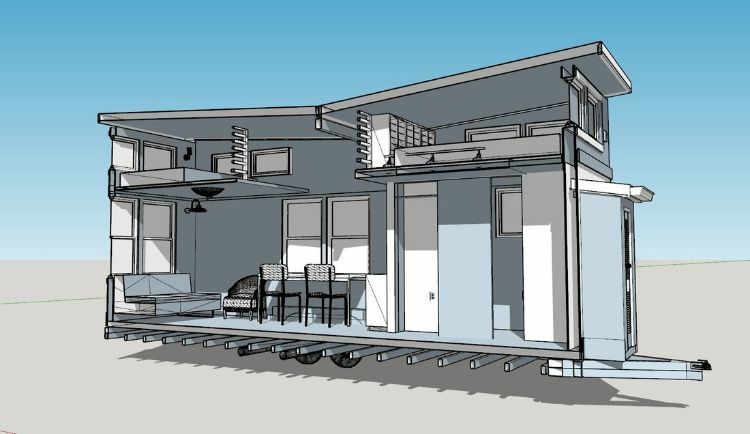 It may not allow for much aerodynamics going down the road, but it gives the sleeping lofts huge amounts of headroom and serves as a rain catchment system that allows the home to stay off-grid without need of a water stop. Constructed with structurally insulated panels, which are known to be stronger and more efficient than standard construction, the Outlander was built on a 24-foot-long by 9.6-foot-wide trailer, giving it a touch of extra width -- which translates into a lot of extra space inside. Here's the basic design of the Outlander. 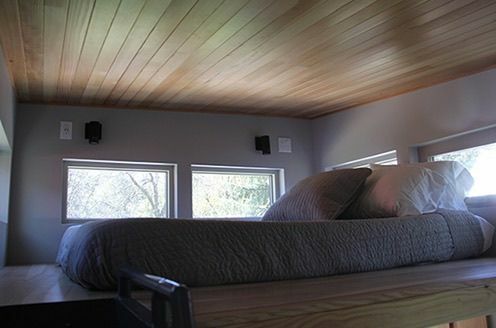 Two sleeping lofts are placed fairly high in the structure, which means the rising roof lines are needed to provide for extra headroom and larger bedroom windows. The larger of the two sleeping lofts has plenty of headroom, lots of light and space for the large storage cabinet on the left. 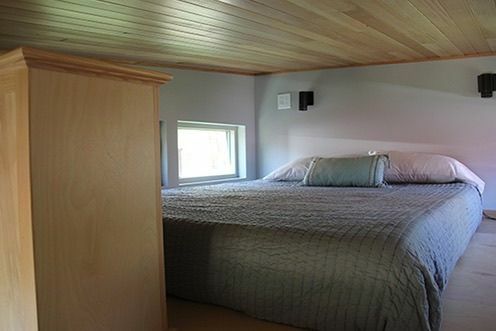 This room is brightened by the natural wood and light-colored paint. This is the smaller of the two bedroom lofts. Although there is not enough room for the storage cabinet, the extra windows behind the head of the bed help the loft feel large. 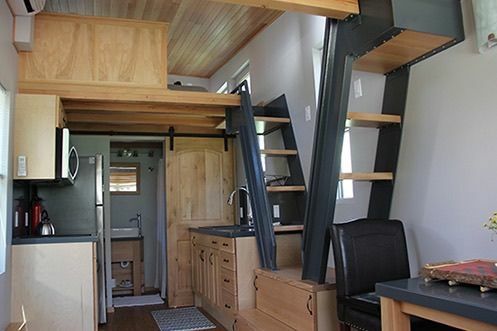 The two ladders to the sleeping lofts share a landing -- a clever way to save a little space. Behind the kitchen is the sink in the bathroom. 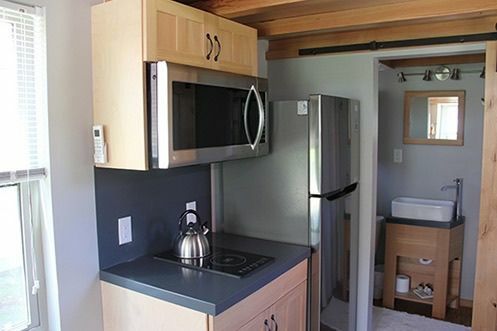 This modern kitchen saves space where it needs to, providing for two countertop stove burners but leaving room for a full-sized refrigerator. Outlander is built to be eco-friendly. 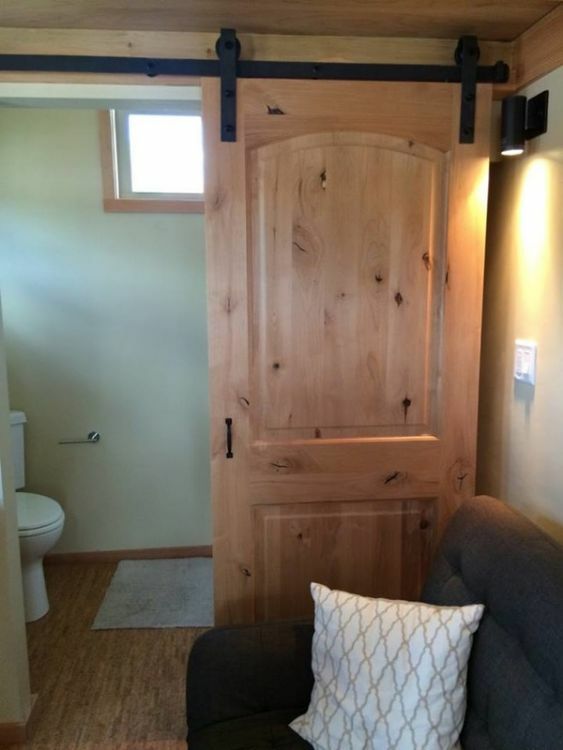 The toilet is a plumbing-free composting toilet that costs more up front but saves tons of hassle down the road. They are easy to maintain and require no hookups to clean. This handsome home with the modern lines also features this bay window-style extension in the front, which allows for side windows and provides for extra living space.